Donating eggs is a profoundly selfless act, and one that will forever change another family’s life. We at DESA dedicate our lives to finding the perfect donors for our recipients; although that is only one part of what we do. We are dedicated to forging and fostering our relationship with our donors. Although donating eggs is an act of kindness and one which offers another family hope, we are just as invested in ensuring that you, the donor, are comfortable, happy and fulfilled through this journey of life! How do couples make a decision to find an egg donor? Very few couples will ever choose an egg donor just because they want to try this option. Most couples are forced into this option, and often this is the very last resort to conceive. It is an extremely difficult and emotional time that often comes with a painful mourning period that is important before couples are ready to move onto the egg donation idea. This mourning period affects both parents and can put a lot of strain on their relationship. By donating your eggs you will ultimately change lives forever. You will give a couple the gift of life and a family of their own. You will give somebody hope through your kindness. How do couples cope with the feeling of loss? Any loss starts with denial. It is important to understand that a couple who had hoped to become parents first need to come to terms with the fact that they cannot conceive naturally. This is a very painful journey, which takes time, but when they realise through many attempts of trying to conceive naturally using their own gametes, that there is only hope through a donor, acceptance is found, and then hope. What type of women choose to be egg donors? 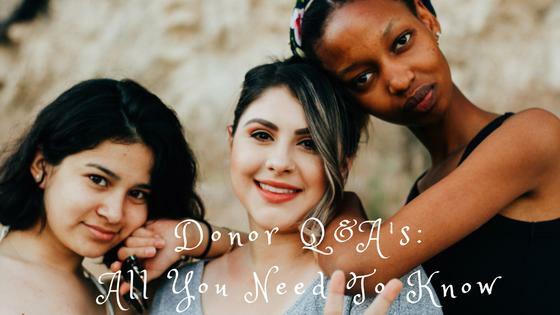 Healthy women of any race between the ages of 19-32 years of age are potential donors. Before your application is approved however, you will need to go through a medical & psychological screening process at DESA. During the screening process you will have the opportunity to meet our psychologist and or social worker to discuss any concerns you might have about donating your own eggs. How do I sign up to become an egg donor? At DESA we have a very thorough screening process once your egg donor application form has been approved. As a potential donor, you will go for a medical screening which will include an ultrasound, a psychological evaluation, as well as a blood test. These results will be shared with you immediately. You will see our psychologist or social worker, as we would like the process to be a fulfilling one, not just for the recipient of your eggs, but for you as well, and it is important at this point to really discuss any concerns or thoughts with our psychologist about donating your eggs. Your full screening as well as counselling, will be done at no cost to you. Contact us here for any questions about donating your eggs. What is BMI and why is it so important when it comes to donating eggs?